They timed the protest to the anniversary of the Russian aggression. Around 30 activists of Odesa's patriotic organisations on 26 February picketed the Russian consulate, demanding that Russia withdraw from the occupied territory of Ukraine, the local news website Dumskaya has reported. The activists said that one should not remember that Russia continues the war against Ukraine and dozens of Ukrainians are still held in the aggressor state's prisons. The consulate was protected by around 50 members of the National Guard and police. The activists lit flares and sang the Ukrainian anthem. 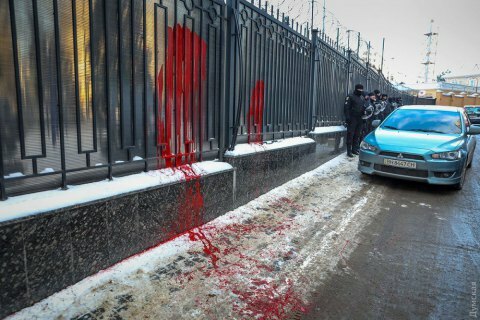 At the end, they daubed the fence of the consulate with red paint. Afterwards, they threw burnt flares over the fence. They timed the event to the anniversary of the Russian aggression against Ukraine. On 26 February 2014, around 7,000-8,000 residents of Crimea under Ukrainian and Crimean Tatar flags gathered for a rally for united Ukraine. They were opposed by around 3,000-4,000 activists with Russian and Crimean tricolored flags who rallied on the initiative of the pro-Russian party Russian Unity. Scuffles broke out. As a result of the confrontation, Crimean Tatar representatives, who were twice as many as their pro-Russian opponents, pushed them from the square outside the Crimean parliament. Two people were killed and several dozen injured in the stampede. A parliament session, which was to discuss the dismissal of Anatoliy Mohylyov's government and scheduled a referendum on the independence of Crimea, did not convene because of the lack of quorum. However, in the early hours of 27 February, Russian troops took control of the Crimean parliament and the council of ministers.